Bernard Talley was born in 1939 in Maryland. He graduated with a Bachelor's Degree in Economics from Mount Saint Mary's University, Maryland, before entering Officer Training School on June 27, 1962. Talley was commissioned a 2d Lt in the U.S. Air Force at Lackland AFB, Texas, on September 25, 1962, and then served as a Supply Officer at McCoy AFB, Florida, until entering Undergraduate Pilot Training in April 1964. He was awarded his pilot wings at Laredo AFB, Texas, in May 1965, and then flew F-4 Phantom II fighters with the 25th Tactical Fighter Squadron at Eglin AFB, Florida, until deploying to Southeast Asia in April 1966. Lt Talley flew 76 combat missions with the 433rd Tactical Fighter Squadron at Ubon Royal Thai AFB, Thailand, before being forced to eject over North Vietnam on September 10, 1966. He managed to evade for one day before being captured on September 11. After spending 2,369 days in captivity, Maj Talley was released during Operation Homecoming on March 4, 1973. He left active duty on October 10, 1973, and joined the Air Force Reserve on October 23, 1973, where he flew C-141 Starlifter transports with the 315th Military Airlift Wing at Charleston AFB, South Carolina, until 1981. From 1981 to 1984, Col Talley served as the first Commander of the 78th Air-Refueling Squadron at Barksdale AFB, Louisiana, flying the new KC-10 Extender tankers. 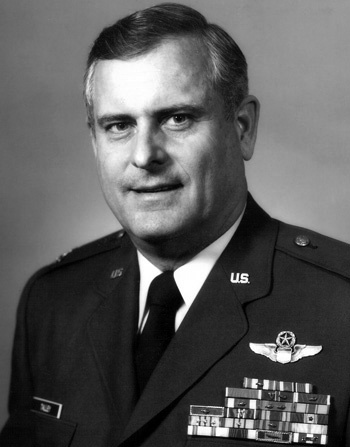 He next served as Vice Commander of the 452nd Air Refueling Wing at March AFB, California, from 1984 until his retirement from the reserves in October 1988. Bernard Talley also served as a pilot with American Airlines from 1973 to 1999, flying the McDonnell Douglas MD-80 and DC-10, and the Boeing 727, 747, 757, and 767. Col Talley is a member of the Reserve Officer Association, the Catholic War Veterans, the American Legion, the Caterpillar Club, the Veterans of Foreign Wars, the Disabled American Veterans, and the Red River Valley Fighter Pilots Association. He was also a participant in the Air Force Speaker's Bureau, and Air Force Academy Liaison Officer, and a member of the former Strategic Air Command Reserve Forces Policy Council. While a member of the Allied PIlots Association, he was the Dallas Fort Worth Chairman of the Professional Standards Committee and National Chairman of the American Airline Jump Seat Committee. He and his wife Devon Crossland Talley live in Frisco, Texas. Col Talley served as the Grand Marshall of the Dallas Veterans Day Parade on November 11, 2013, in Dallas, Texas, and he is a member of the Order of Daedalians. First Lieutenant Bernard L. Talley, Jr. distinguished himself by gallantry in connection with military operations against an opposing armed force over North Vietnam on 3 September 1966. On that date, Lieutenant Talley conducted a night strike on a vital supply and storage area of the hostile force in a highly defended area. With complete disregard for his own safety, Lieutenant Talley continued the attack in the face of intense defenses to deliver ordnance on the target, completely destroying it. By his gallantry and devotion to duty, Lieutenant Talley has reflected great credit upon himself and the USAF.